This year’s edition of the Tällberg Forum gave me the opportunity to meet, once again, Prince Turki Al-Faisal from Saudi Arabia. Seven years ago in 2006 I discussed with him the future of oil production and Peak Oil. That was definitely one of the high points in my career as a participant in the debate over oil production. In my book Peeking at Peak Oil I describe this discussion in Chapter 13. Of course, it goes without saying that this year I gave a copy of my book to Prince Turki and I could tell that he read Chapter 13 immediately thereafter. On the evening after the dinner I was invited to join him to discuss oil, the Middle East and other interesting issues. When we parted after some hours he said that he hoped that we could meet at some time in Saudi Arabia. It would be wonderful if this invitation could be realised but it will be Saudi Arabia’s national oil company, Saudi Aramco, that will, ultimately, determine whether or not that occurs. Below is a photograph of the Prince and myself and below that is the text from my book where I describe meeting Prince Turki Al-Faisal in 2006. It was the Prince who suggested that the photo should be taken showing us and the book. One especially impressive memory I have from my trip to Abu Dhabi in 2004 is of the beauty of desert sunsets. However, breathtakingly beautiful sunsets are also a feature of midsummer evenings in the Dalarna region of Sweden. In June 2006 I was in Tällberg, Dalarna, a bedazzlingly green cultural landscape dotted with traditional red Swedish cabins where the sun drifts slowly down over a body of water named Siljan. However, it was not the breathtaking sunsets over Siljan that drew me to Tällberg. Rather, I was invited to the Tällberg forum to participate in a discussion titled The new landscape of human security. 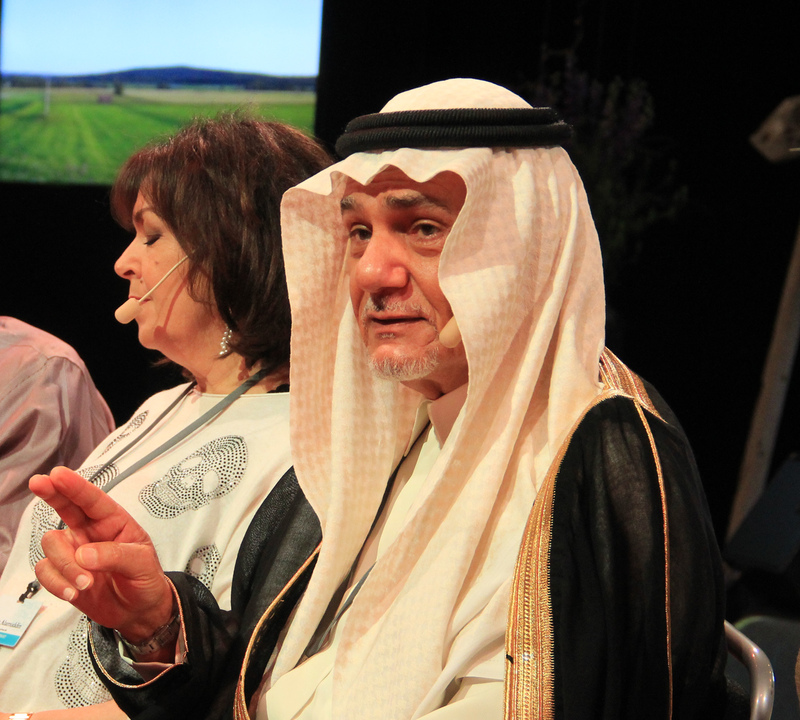 This debate was opened with a speech by Prince Turki Al-Faisal who, in 2006, was Saudi Arabia’s Ambassador in Washington. 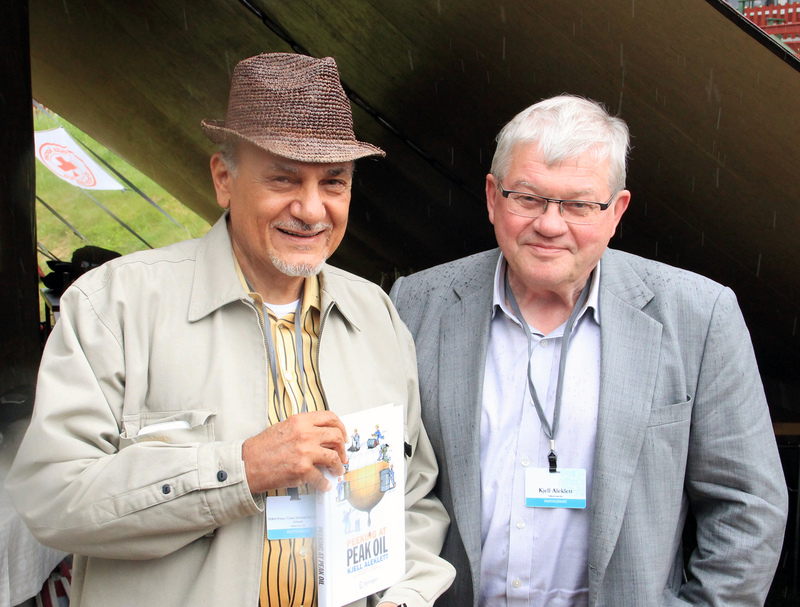 As I see it, Peak Oil will mean an enormous change in our future cultural landscape and I was very keen to discuss another kind of sunset with Prince Turki Al-Faisal – the sunset described by Matt Simmons in his book, Twilight in the Desert. I can best describe the Tällberg forum as a forum where the world’s non-governmental organisations (NGOs) and political and business leaders are gathered under one roof for an open discussion of important future global issues. In reality the roof is that of a large tent. In 2006 the theme for the forum was How on earth can we live together? I asked Prince Turki Al-Faisal’s secretary if it was possible to have a personal meeting with the prince and a time was arranged for the morning before the afternoon on which “The new landscape of human security” would be discussed. When it was time for our meeting I found that it had been expanded into a lunch with the prince’s wife as additional company. During the lunch we had an interesting discussion about Peak Oil and other relevant issues. As expected, the prince did not see Peak Oil as imminent, and especially not for Saudi Arabia. Årets upplaga av Tällberg Forum gav mig möjlighet att än en gång få träffa Prince Turki Al-Faisal från Saudiarabien. För sju år sedan, 2006, diskuterade han och jag framtidens oljeproduktion och Peak Oil. Det är definitivt en av höjdpunkterna i min karriär som oljedebattör. I min bok Peeking at Peak Oil berättar jag om detta möte i kapitel 13. Det blev självklart att lämna över en bok till Prince Turki, och det visade sig att han direkt läste kapitel 13 om Saudiarabien. På kvällen efter middagen blev jag inbjuden till hans sällskap för att diskutera olja, Mellanöstern och andra intressanta frågor. Då vi efter någon timma skiljdes blev avskedsorden att han hoppades att vi skulle ses i Saudiarabien. Det vore fantastiskt om den inbjudan blir till verklighet. Det blir Saudi Aramco som till sist avgör om jag blir inbjuden. Här följer texten från boken där jag berättar om mötet med Prince Turki Al-Faisal. Det var han som föreslog att vi skulle ta det kort som visar oss två och boken.